The DAISY Award is an international recognition program that honors outstanding nurses. Citizens Memorial Hospital/Citizens Memorial Health Care Foundation is proud to be a DAISY Award partner since 2019. The DAISY Award is an international program that rewards and celebrates the skillful compassionate care nurses provide every day. The DAISY Foundation was established by the family of J. Patrick Barnes after he died from complications of the auto-immune disease Idiopathic Thrombocytopenia Purpura (ITP) in 1999. DAISY is an acronym for Diseases Attacking the Immune SYstem. The Barnes Family was awestruck by the clinical skills, caring and compassion of the nurses who cared for Patrick during his hospital stay and created this international award to say thank you to nurses everywhere. Models empathy and demonstrates a caring attitude in all situations. 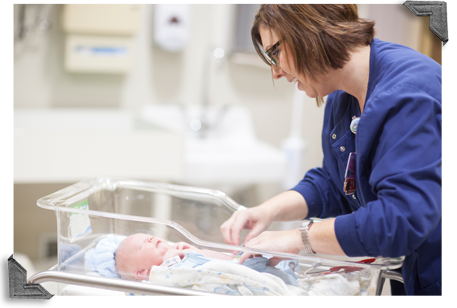 Demonstrates extraordinary clinical skills in the delivery of compassionate patient care. Exemplifies the mission, vision and values of CMH/CMH Foundation. Establishes a special connection with patients and families. Is an outstanding role model for the nursing profession. Has significantly affected the life of a patient/family by going above and beyond. Each month’s winner receives a DAISY Award honoree pin, a Healer’s Touch hand carved statue, an award certificate, copy of the nomination, and DAISY bag. In addition, the selected nurse’s unit/department/clinic/facility receives a banner to post for the month and freshly baked cinnamon rolls for everyone on the day the award is presented. Completing the electronic nomination form below. Filling out a nomination form found at the hospital/department/clinic/facility and either mailing it to the address listed on the form or dropping it into one of the DAISY Award submission boxes at CMH. Questions? Contact Sarah Hanak, CMH DAISY Award program coordinator, at 417-328-7775 or email DAISY.Award@citizensmemorial.com.